Best Buy is currently running a promotion on Cricket Wireless SIM cards and airtime cards. Best Buy has put Cricket Wireless SIM cards on sale at a cost of 99¢ each. 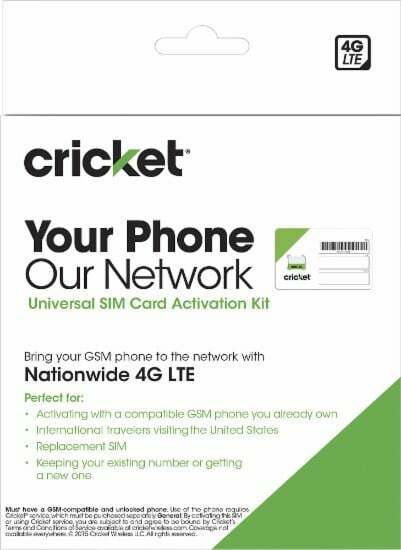 Those that purchase a SIM card are eligible to also purchase an airtime card for 20% off, making this a great deal for those looking for service on Cricket Wireless or even those who want to refill their Cricket Wireless account on the cheap. Savvy buyers will find it worthy to buy a SIM card whether they need one or not to save a few dollars on their phone bill. So, depending on which plan you have, and what your sales tax rate is, you could be inline for some nice savings on your Cricket Wireless bill next month. Just note that Cricket says your airtime refill cards must be used in full, so you cannot buy a $60 airtime card to use with the $40 plan this month and have money leftover to use on your bill the following month.